… but the signs of the times are all contrary to the maintenance of this halfway position; liberty is certainly held by but a precarious tenure when once its underlying principles have been lost. For a time it looked as though the utilitarianism which came into vogue in the middle of the nineteenth century would be a purely academic matter, without influence upon daily life. But such appearances have proved to be deceptive. The dominant tendency, even in a country like America, which formerly prided itself on its freedom from bureaucratic regulation of the details of life, is toward a drab utilitarianism in which all higher aspirations are to be lost. Has this not been the trend of our school systems since the time of Machen’s writing? Has their goal not been to produce citizens capable of contributing to the economy and nothing more? And along the way, have they not stifled the higher intellectual pursuits? Long gone are the days of critical thinking and philosophy in public schools. Such things simply cannot be connected to productive output, and so they are disallowed. Want proof that this is the state of things? I propose a test: simply mention a perspective that doesn’t fit the narrative that was given in school. Question the validity of some State program that was taught as a good and necessary thing in your school years. How quickly will you be called crazy, or worse? Even if, by sound reason and evidence, you can support your position, are you met with equal reason and evidence? Or does your attempt to back up your position provoke an emotional response? Recent events have troubled me, as they should trouble us all. It seems that the hits just keep on coming, and now they’re coming rapid fire. Three incidents in one week!? That’s crazy. Between Philandor Castile, Alton Sterling, and the Dallas shooting, there’s so much to cover. I’m not here to cover the facts of those case. What can be know, can be learned elsewhere, and there is still much that hasn’t come out yet. But regardless of the facts of the case, what we are left with is seven men who are no longer among the living and a sickening feeling in our stomachs. Do you feel it? I sure do. All seven of these deaths are, from what I can gather, senseless and unjustified. I don’t know, maybe facts will come out to change that, but I always start with this presumption. It doesn’t matter the situation. Death is never the ideal outcome. Aggression is never the prescribed course of action. De-escalation is always to be preferred to escalation. These situations all went seriously wrong at some point when someone chose to act with aggression and escalate the situation, and the result was death. Death for an innocent or death for the guilty? We may never know, and if we can know, only time will tell. In any case, I’m left sickened. But there’s another feeling deep inside me, and that is a feeling that I need to address. It’s the feeling that things are happening. The stuff is hitting the fan, so to speak. I can’t help but feeling that this shooting in Dallas may be a signal of history repeating itself. Could this be the next Lexington and Concord? It could very well be. Only time will tell, but we may be witnessing history unfold before our eyes. Certainly if the government wants a civil war, they can pretty much guarantee it by their response here. And it would be just what you expect. They will use this as reason to beef up the police state, sowing the seeds of future conflicts with citizens. They will even point to this as justification for the pre-existing police state, ignoring all cause and effect that lead up to it. How will the State respond to this shooting? Will they escalate? Will they come for guns? Will they enter homes? Will they institute martial law? Will they further militarize police? Willthey involve the police/national guard? If they do all that, how will Americans respond? In short, is America gonna America? I can’t help but feel like history is repeating itself, and that a civil war is coming. Maybe not this year, maybe not in the next five years. But can this current conflict go on and continue to escalate without blowing up? I say no. It can’t. So I find it necessary to clarify that I in no way condone the actions of the sniper. This was a horrible, despicable act of violence that should never be tolerated in civil society. However I may sympathize with his motivations (I don’t know those motivations for certain, not having spoken to him), this is not the way you go about making your point. These cops were not your enemy. There’s a deep problem in the system. There’s a lot of disagreement about what exactly that problem is or where it comes from, but it cannot be denied that there’s a deep problem in the system. And some cops are part of the problem. But these cops were not. In fact, they were part of the solution. In one sense you’re right. But in another very important sense, you’re wrong. Dead wrong. Yes, it’d be awesome if the good guy cops would stand up to the State’s unjust laws and refuse to enforce them, like the midwives in Egypt. It’d be awesome if they would report the misdeeds of their fellow officers to internal affairs and if internal affairs would actually investigate them thoroughly to fully resolve the matter rather than sweeping them under the rug. In this way, the fact that good cops don’t hold each other or the system accountable is unfortunate, and in one sense could be said to be a part of the problem. But the problem is much deeper than them. It still lies with the State and the departments they are employed by. I insist that 99.9% of cops out there are among the most upstanding individuals you can find in society who joined the police force out of a genuine desire to bring justice to those who harm the innocent. This is to be commended and honored. Are there bad apples in the bunch? Sure. But it doesn’t mean that the rest are all bad too. But that doesn’t mean that the system they work for is good. It doesn’t mean that there isn’t a problem with the State itself and the departments these officers are forced to work for because of the monopolies maintained by the State. Good cops are in bad situations because of bad laws. These officers who were gunned down in Dallas were examples of those good cops. They were stellar examples to boot. They were shot while on duty serving peacefully to help protect protestors at a demonstration that was being held to protest the police. Think about that sentence and let it soak in. These were the best of the best, guys. I need to have a word with the shooter here. What do you think you accomplished by shooting these men? What justice do you think was served? I’m all for justice being served. But this. isn’t. it. These cops were not the ones who shot Philandro Castile. They didn’t shoot Alton Sterling. They didn’t kill Tamir Rice or Eric Garner. But they were to helping protect the people who were protesting them! And you gunned them down. How shameful and cowardly of you. And to all you liberty minded folks out there who might be tempted to applaud this, remember: our revolution cannot be waged on any battle field. Our battle cannot be won by force of arms. Why? For two reasons. The first is that our fundamental principle is Non-Aggression, and War is the exact opposite. We can’t advance the cause of liberty through aggressive means. There’s something to be said for defending ourselves when attacked, but initiating conflict is never to be done, encouraged, or applauded. Second, cops are not the problem, as I’ve already said. They are not our enemy. The system that uses them as its enforcers is, but that system will use them as front lines of any war we might try to wage. The result would be a catastrophic loss of innocent life on both sides. Yeah, you’d hope the cops would never go along with the State’s orders, but you gotta remember how strongly they believe in the goodness of the State, and how hard it would be for them to question anything the State says. All the State has to do is call us terrorists or whatever, and that will be all the justification they ever need. Because why would the State ever lie about that? We know they would. Cops, unfortunately, don’t believe that. Cops are not our enemy. They are a crucially important servant in our society who exists to bring criminals to justice. Except for the handful of bad ones out there, cops generally want to do that job well. No, cops aren’t the problem. The State is. But what is the State really? I mean, where does it get its power? How does it keep getting away with these attrocities? Because there are far too many people out there who refuse to question the State. The vast majority of people believe that these heinous atrocities committed by the State are somehow justified and necessary. I mean there’s a lot of outrage that Castile and Sterling were killed. But where’s the outrage about the drug war that imprisons plenty of men and women who weren’t killed. Society is plenty fine with lesser aggressions, because they believe the States’ justifications for them. They’re plenty fine with bombing children in other countries because they’re the enemy. No the State is not even really the problem. The State is a tiny entity compared to its people. If we simply seceded and withdrew our support from the State, there would be nothing they could do about it. The problem is the people. Ordinary every day Americans who think that the State is this benevolent agency that only does good things. I mean, we don’t like it when the other party is in power, but even what they do is better than not having a State at all. I mean, who would build the roads, right? So here’s the point. If Cops aren’t the enemy, but people who continue to believe in the State are, and we’re going to go shoot the enemy, who are you going to shoot? Are you going to shoot your neighbor who’s voting for Hillary? What about the guy who works down the hall who’s voting for Trump? No, our “war”, our “revolution”, if it is to succeed, must be won by persuasion. We must peacefully spread the ideas of liberty to those around us. Then, and only then, would the peoples’ support for the State evaporate, and then, and only then, will society find a better way. This, of course, all casts the best of motives on the shooter. Who knows? Maybe he was just a terrorist? Maybe he was in ISIS? Maybe he was in the mod or from the drug cartel? Who knows? But it doesn’t matter, because even in the best of cases, we should decry this as senseless and heinous. Also, the result will be the same, nonetheless. The State will likely use this as an excuse to further beef up the Police State. To what extent? We shall see. What will happen as a result? Time will tell. Was this another Lexington and Concord? Was this a shot heard round the world? I seriously hope not. I would love to live in a truly free society, but war is not the way to achieve that. Plus there’s no guarantee we wouldn’t end up with a Robespierre on the other side. I would rather these matters can be resolved peacefully. I would rather people come to realize that the State is unnecessary and simply withdraw their consent wherever and however peacefully possible. But I have a strong feeling that the pieces are already in motion, and I think it wise to begin to gird our minds for the coming conflict. So what should our mindset be as Christians? Which side should we be on here? If there is a war, what should we do? Should we join in on either side? I say no. We should not choose either side. This is not our war. Our battle is not against flesh and blood. For us, all of this is secondary to our great commission to make disciples. Peter calls us to live as free men, and so we will no matter what. There’s definitely a common interest between the gospel mission and the liberty revolution, which is why I am a Reformed Libertarian. There’s also a common interest between the gospel and the peace that can be had in society when criminals are brought to justice, as the police, ideally, do. We cannot favor one side or another of this coming conflict. We owe allegiance to neither. Our allegiance belongs to Jesus Christ alone, and his kingdom is not of this world. While we’re here in the world, though, what should we be doing? Making disciples. Liberty would give us the freedom to that in peace, a privilege we have enjoyed for a long time in this country. Many have sensed a change in the winds, and as long as the State remains unchecked, those winds will continue to change. So what do we do? Do we make it our mission to check the State? I say no. Our obedience to our great commission is not dependent upon favorable conditions. We are called to faithfulness no matter what. Further, our battle is not against flesh and blood. We are called to honor the emperor (1 Peter 2) and be subject to his authority (Romans 13). But let us never confuse this with an obligation to capitulate to his demand that we call evil good and call good evil. 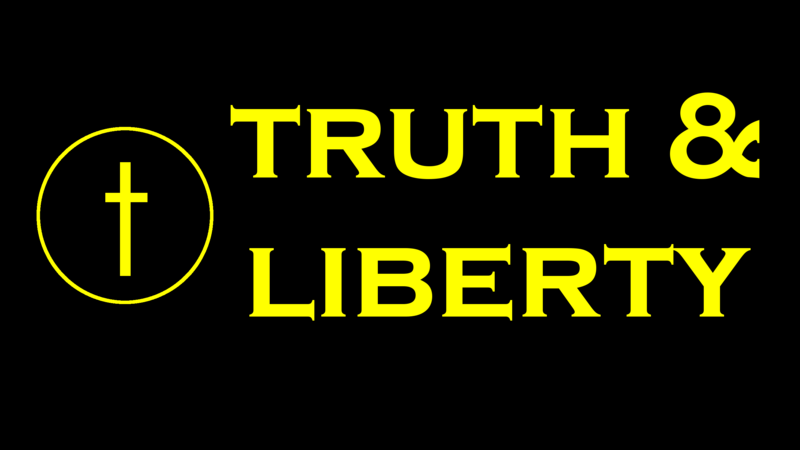 We must, as the pillar and buttress of the truth, reserve the right to speak the truth. And when his evils cause the weak to be oppressed around us, shall we remain silent? I say no. So as long as we have latitude to do so, I say we must proclaim the cause of liberty. It is secondary to the gospel, but it is critically important nonetheless. The two go hand in hand, I believe, for where Christ is regarded as King, allegiance to earthly kings ought rightly to subside. Our message must begin and end with Jesus as Lord and Savior. But in the middle what are we saying? Are we calling good good and evil evil? I do hope so.